Why the long face? Horses can remember the facial expressions they see on human faces and respond differently if you smiled or frowned when they last saw you. Leanne Proops, now at the University of Portsmouth, UK, and her colleagues at the University of Sussex showed in 2016 that horses respond differently to photographs of happy or angry human faces. Now they have studied whether horses can form lasting memories of people that depend on their facial expressions. First, they showed horses a photo of one of two human models, displaying either a happy or angry face. Several hours later, the model visited the horse in person, this time with a neutral expression. As a control, some horses saw a different model in the second part to the one they saw in the photograph. I believe that I shall always miss David Letterman’s Top Ten lists. After teaching so many clinics, meeting new riders or prospective riders or riders who have an inkling that they might love our sport “if only … ” — I can almost finish the questions before they are asked. Here’s the Top Ten list — and some answers! 10.) This Sport is OVERWHELMING! Where Do I Begin? 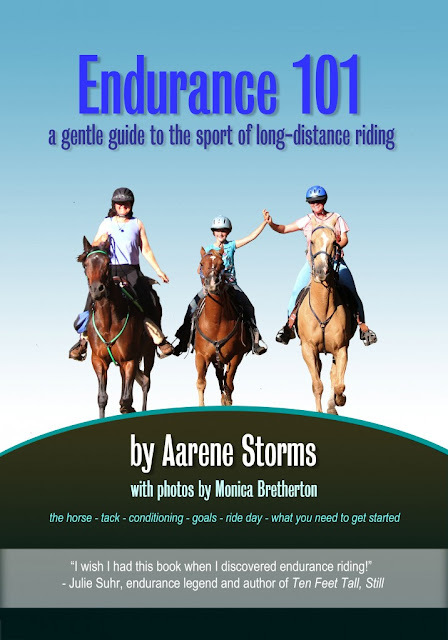 Recently, I compiled a list of books--there are so many new titles!--for Endurance News magazine, the publication of the American Endurance Rides Conference. It's in the April 2018 issue, if you want to hunt for it. If you don't, you've come to the right place. IMPORTANT: I don't recommend every book on this list! As I explained in an earlier post, not all books are suitable for all readers, and some books were obviously written by the Bad Idea Fairy. My personal favorites are marked with an *, but use your CRAAP Criteria (it's really called that) to evaluate what you read. All the horses in the barn get the same amount of feed every day; it makes feeding time much simpler. The warmbloods look super. Their weight is good, and their coats are gleaming. However, the one Thoroughbred in the barn who arrived a little thin six months ago has not put on any weight. In fact, he has lost body condition. He is getting grain just like the other horses, so what could be wrong? A veterinarian has thoroughly examined the horse and nothing appears to be wrong. Could it be as simple as insufficient caloric intake? What kind of changes can be made to his feeding program to encourage weight gain? Sometimes, getting a thin horse to gain weight is simply a matter of increasing the caloric density of the diet. Other times, the diet may need to be higher in calories because of a medical, psychological or environmental problem. What makes a horse a hard keeper? The metabolic rate determines whether a horse is an easy or hard keeper, and the variation between horses can be extreme. How to help performance horses of all types reach peak fitness. That competitive edge. It might look different for different disciplines, but this intangible has its roots in the same concept: conditioning. In short, conditioning develops the musculoskeletal, neurologic, and cardiovascular systems so they can perform athletic endeavors with the greatest efficiency and the least stress on the body. In this article we’ll learn how riders from different disciplines condition their horses. While there is no magic recipe fit for all equestrian sports, the basic principles of conditioning remain the same across the board. To get fit for competition, your horse needs to be “legged up,” which entails preparing the musculoskeletal system to withstand a certain amount of impact, speed, and duration of work. Then you build upon this foundation in a stepwise fashion, first increasing distance at the walk and trot and then increasing intensity to include canter/lope and gallop and/or incline work. The initial exercise demand (completed at the walk, trot, slow canter) is generally known as long, slow distance (LSD) training, and it develops the cardiovascular system and aerobic energy pathways to fuel the muscles. Aerobic metabolism occurs when muscle cells use energy sources in the presence of oxygen. Higher intensity exercise, such as sprints, gallops, difficult hill climbs, or jumping efforts, requires rapid muscle metabolism that taps into other energy sources in the absence of oxygen. Use a heart rate monitor to assess your horse’s progress in real time; heart rates between 130 and 150 beats per minute (bpm) indicate a range that will improve fitness. Reduced performance, including a shorter stride length, is likely a consequence of pain caused by equine gastric ulcers. No matter the discipline in which you compete, your horse’s stride length is important. Longer strides can mean faster times, bigger jumps, and prettier movement. To get that edge, horse owners often focus on conditioning and joint health. Another key area to focus on is digestive health, specifically with regard to equine gastric ulcers. The way performance horses are commonly fed, along with the stress of training, showing and traveling, causes acid levels to rise past the glandular portion of the horse’s stomach, leading to ulcers. That pain from sores on the stomach wall can cause your horse’s performance to suffer. Two out of three performance horses have stomach ulcers, and a study has shown that horses with ulcers have a shorter stride length than those without. Preventing ulcers is the optimal way to ensure that they don’t inhibit performance. Omeprazole (a U.S. Food and Drug Administration-approved product is marketed as UlcerGard) inhibits acid production at the source—the proton pumps in the lower part of the stomach. To prevent ulcers, in addition to omeprazole, Cheramie suggests feeding management changes when appropriate, such as increasing grazing time, using a slow-feed hay net, replacing calories from cereal grains with good-quality roughage or fat, and adding alfalfa to the diet. Finding ways to increase stride length and ensure your horse is performing to the best of his ability is challenging enough. Don’t let equine gastric ulcers negatively affect performance. Keep digestive health and ulcer prevention a top priority. I manage endurance horses. I have experience using alfalfa during races, but I have been told to not use it between races, when I'm training, as it could cause metabolic problems. Can you please tell me your thoughts? Many performance horses benefit from alfalfa. The forage can be used successfully in endurance horses with some precautions. When President Trump signed a $1.3 trillion omnibus spending bill it also passed an extension on the electronic logging device (ELD) implementation for livestock haulers. The bill passed on March 23 included a mandate for livestock and insect haulers to have a delay until Sept. 30, 2018. What prevention steps can I take for my horse’s rear leg swelling after exercise? Q. My 3-year-old mare’s rear legs swell around the tendon and fetlock area overnight after exercise. She is not lame or sore, but I have dimethyl sulfoxide (DMSO)/furacin (nitrofurazone) wrapped it when it swells. This worked the first time but now it just helps a little. Is this swelling common, what it could be, and are there any prevention steps I could take? A. Fluid-filled swellings in the rear aspect of the tendon/fetlock area—called “windpuffs,” or synovial effusion of the tendon sheath—are a common condition in horses. They result from inflammation of the digital flexor tendon sheath, the structure that encases the deep and superficial digital tendons that run from the back of the knee down to the fetlock. There are two types of windpuffs: idiopathic (of unknown cause, but they do not cause any problems) and pathologic (caused by disease). The 2018 Omnibus Spending Bill will impact the horse industry in several ways. Horse processing plants will remain shuttered, the Bureau of Land Management (BLM) cannot sell wild horses without reservation, and the USDA Animal and Plant Inspection Service (APHIS) will receive additional funds to enforce the Horse Protection Act (HPA) under the 2018 Omnibus Spending Bill, which President Donald Trump signed into law on March 23. Under the $1.3 billion measure, the USDA cannot use any of its funds to conduct horsemeat inspections processing plants, effectively preventing U.S. horse processing plant development. The spending bill also forbids the Department of the Interior’s (DOI) BLM from selling wild horses and burros without reservation—that is, to any buyer—but allows the agency to transfer equids removed from the range to other federal state or local agencies to be sued as work animals.